We’re excited to return to Austin, TX to showcase local and global artists on Friday, March 15 at The Infinite Monkey Theorem Austin from noon-8pm! Free show! Note: Showcase is taking place during SXSW and not affiliated with SXSW. Featuring performances by Dorton, Megan Blanchard, Blushh, Theodore, Soran, Drew Young + Amy Lott, Winters End, Cosmic Botanica, Parrot Dream, Buenos Diaz and Jane N’ The Jungle! Thanks to our partners at Blue Microphones & Ultimate Ears, Bose Professional audio, Voyage-Air Guitar, Lifeway Kefir, Saffron Road foods and friends. We’ve partnered with Infinite Monkey Theorem Winery in Austin and The Brunch for a music showcase during the week of SXSW music festival. Free to attend, all ages. Featuring performances by Youth Soul Love, Carissa Johnson, Vanessa Silberman, Myla and Michael Hardie, Mohamed Aleau, Divided Heaven, Dorton, DJ L.A, Megan Blanchard and Fruit & Flowers! Thanks to partners and supporters at Blue Microphones & Ultimate Ears, Bose Professional, Dorton Studios, Lifeway kefir, Saffron Road foods, Voyage Air Guitar, The Brunch, Infinite Monkey Theorem and friends. Note: This event is not an official SXSW event and not affiliated with SXSW. We are pleased to return to Austin, TX to support the #MusiciansForMicrocredit showcase supporting Whole Planet Foundation and presented by Lifeway kefir at Whole Foods Market Domain, March 17-18, 2017. Free & all ages. Donations to benefit Whole Planet Foundation’s global microlending programs during its annual Prosperity Campaign. RSVP here. Featuring a fantastic lineup of performers. Thanks to our partners at Goodpop, VOSS Water, Rhythm Superfoods, KIND Snacks, BOSE Professional Audio, Hatcreek Provisions, Saffron Road and friends. Planet LA and friends return to Austin to put on a showcase at Mozart’s at Lake Austin. Saturday, March 19, 2016, Noon to 6pm. Featuring RJ Comer, Peppina, Eric Dorton + Frankie, Shani Rose, Racing on the Sun featuring Gabe Kubanda, BOSE Troubadour Tour, Patrick Joseph and Empra. Special thanks to our partners at TC Helicon and TC Electronic, GigTown, Rhythm Superfoods, Emmy’s Organics and Justin’s. 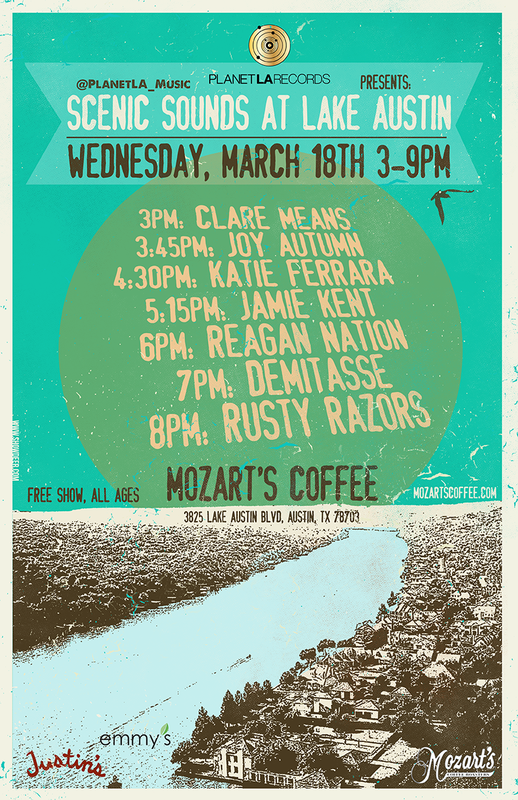 We’re showcasing local and touring artists during SXSW 2015 at Mozart’s Coffee on Lake Austin on March 18, 2015. Featuring Texas bands Rusty Razors, Demitasse and Regan Nation and visiting artists Jamie Kent, Katie Ferrara, Clare Means and Joy Autumn. Thanks to supporters Emmy’s Organics and Justin’s.